Cedar Grove, NJ – Essex County Executive Joseph N. DiVincenzo, Jr. announced the completion of the 77-acre Essex County Cedar Grove Park and the Robert J. O’Toole Community Center on Fairview Avenue in Cedar Grove on Monday, December 12th. Developed on the site of the old Essex County Hospital Center, Essex County Cedar Grove Park is the first county park in Cedar Grove and becomes the 23rd park in the historic Essex County Parks System. The Robert J. O’Toole Community Center is named for Robert O’Toole, the township’s retired three-term mayor and 12-year councilman. “Preservation of this land for passive recreation and a community center fulfills a promise we made in 2007 to minimize development on the old hospital complex. Essex County is one of the most densely populated counties on the East Coast and creating 77 acres of open space will maintain the suburban character of Cedar Grove, provide additional recreation opportunities and enhance residents’ quality of life,” DiVincenzo said. “One of the main features of the Park is the Essex County Robert J. O’Toole Community Center, named for retired Mayor and Councilman Robert J. O’Toole. Mr. O’Toole has served his community for half a century and was a staunch advocate for limiting development on the property. We can think of no more appropriate person after whom to name the building,” he added. “Thank you for dedicating this building in my honor and thank you, on behalf of the Cedar Grove residents, for this beautiful park. It will be enjoyed by many for generations to come,” Robert O’Toole said. “I call Joe DiVincenzo ‘Mr. Parks’ because of all the improvements he has made to the parks throughout Essex County. We had been trying to create a community center and Joe came riding in on his white horse with this plan,” he added. “For Cedar Grove to have a county park and a community building like this is unbelievable. We are looking forward to the generations of residents who will gain enjoyment from this. I have become a believer in Joe DiVincenzo, because when he says he is going to do something, he gets it done,” NJ State Senator Kevin O’Toole said. “My father was the primary driver behind getting a park for Cedar Grove. And this community center is as much a tribute to my father as it is for my mother – and to all our fathers and mothers – because of what they contributed to making the town what it is today,” he added. The new Essex County Cedar Grove Park is 77 acres of open space situated along Fairview Avenue in Cedar Grove. It becomes the fourth largest County park, behind Branch Brook Park, Weequahic Park and Brookdale Park. There are about two miles of walking paths through the park with historic lighting, a gazebo, benches and trash receptacles. On the eastern side of Fairview Avenue is the 15,000-square-foot Essex County Robert J. O’Toole Community Center, named for the retired Cedar Grove Mayor and Councilman Robert J. O’Toole. The building has a covered portico in front and a covered patio in the back. It is envisioned that the building will house a daily congregate meal program offered by the Essex County Division of Senior Citizens as well as be available for other community organizations to hold meetings and special events. Adjacent to the community center are four bocce courts and a playground designed with a farming theme to connect to the history of the Essex County Hospital Center when there was a farm on the site to support the hospital. Local officials shared their enthusiasm for the new park and community center. “This is a magnificent structure and it’s fitting to honor a person who is a role model for elected officials throughout the state. This is a great honor because Mr. O’Toole epitomizes public service,” Sheriff Armando Fontoura said. “I want to thank Joe DiVincenzo for making Essex County better and better. This park and building are examples of all the great work that he’s done,” Freeholder Patricia Sebold said. “Naming the building for Mr. O’Toole is the right thing because of all that he has done, and all that his family has done, in Cedar Grove,” she added. “The County Executive had a vision for this park and we can all see how popular it has become even before it was finished,” Freeholder Len Luciano said. “Mr. 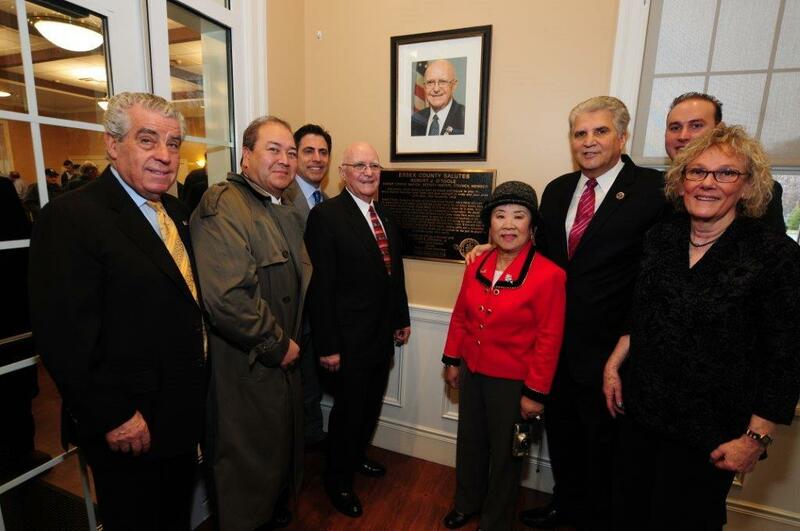 O’Toole has dedicated his life to Cedar Grove and, with this building, his legacy will not be forgotten,” he added. “I really want to thank the County Executive for following through on both of promises to build this park and community center and to get them both opened by the end of this year. How this land was developed was the single most important issue we have had to address and it was clear that the County Executive understood our dilemma,” Cedar Grove Mayor Peter Tanella said. “It is an honor to participate in this recognition of my friend, Robert O’Toole. I can’t think of anyone more deserving and who has given more to Cedar Grove,” he added. Mr. O’Toole served three terms as Mayor of Cedar Grove and three terms as Deputy Mayor during his 12 years on the Municipal Council. He retired from public office in 2015 after deciding not to seek re-election after serving three terms. One of his platform issues was preserving what was known as “Parcel 5” of the old Essex County Hospital Center on Fairview Avenue as open space. He worked diligently against the overdevelopment of Cedar Grove, to preserve as much of the hospital tract as open space. He also was a proponent of reducing local property taxes while providing quality services to keep Cedar Grove as an attractive and affordable place to reside; and promoting quality of life ordinances, including the creation of an “Animal House” ordinance to hold landlords responsible for rowdy tenants. Mr. O’Toole also has a lengthy resume of public service to the Township, working as a member of the Cedar Grove Volunteer Fire Department for 45 years, establishing and serving as a founding member on the Peckman River Regional Control Board to address flooding along the Peckman River; and serving on the Cedar Grove Historical Society, Board of Education, Senior Citizen Club and Planning Board, volunteering as a coach for Little League football and baseball teams, and being involved with St. Catherine of Siena Church, its school and its annual Carnival. He enlisted twice in the U.S. Army and served in Korea, and is a member of the Korean War Veterans Association and American Legion. The land which was the last remaining parcel from the old Essex County Hospital Center complex was slated to be sold to a private developer, but in 2008 the County Executive and the Board of Chosen Freeholders initiated a change in policy and decided to preserve the land as open space. A lengthy lawsuit involving the developer, the County and the Township was resolved in 2015 when a compromise was reached. The engineering firm of CME Associates from Parlin received a $650,000 contract to design the new park. JC Landscape Construction from Pequannock was awarded a publicly bid contract for $11.05 million to perform the construction work. The Essex County Department of Public Works monitored the project and answered questions so that delays were avoided. The project was funded with a $5 million grant from the NJ Green Acres program, a grant from the Essex County Recreation and Open Space Trust Fund and the Essex County Capital Improvement Budget. Construction started in May and was completed in just six months. Essex County Cedar Grove Park is the fifth new park to be added to the Essex County Park System since 2007. The 11-acre Essex County Kip’s Castle Park in Montclair and Verona was preserved in 2007, the 10-acre Presby Memorial Iris Gardens was preserved in 2009, the 2.7-acre Essex County Veterans Memorial Park in the Essex County Government Complex in Newark opened in 2009 and the 12.3-acre Essex County Riverfront Park was created in 2012.